I LIKED YVONNE BUCHAN FROM THE VERY FIRST HANDSHAKE, but what impresses me most is her enthusiasm for her latest project. She and a couple of investors are in the early stages of an ambitious flip on Johns Island. "I knew the water was close," I told her, "but I didn-t realize just how close it is." "It surprises everyone," Yvonne said. "Some of my friends say it-s like a present when they see it for the first time." I couldn-t agree more as I look out on a 1,000-foot dock stretching over deep water, but what really draws my attention is the house. 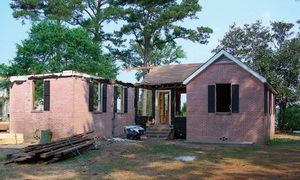 The original structure, a nondescript brick house of about 2,400 square feet is completely gutted and the renovation is beginning to take shape around it. "You-re standing in the living room now," Yvonne tells me as I walk through, "and over here is the kitchen." I-ve looked at the blueprints, so I can get a feel for the general layout of what promises to be a spectacular waterfront home when it is complete. Plans call for an open, airy floor plan with 19- or 20-foot ceilings in the great room, a formal dining room, a country kitchen and a spacious master bedroom suite, as well as a loft, on the second floor. "The loft will make a nice office," says Yvonne, "or maybe the owner will want to make this a bedroom." You see, even though this is a labor of love, Yvonne won-t be living in the new house. "Oh, I can-t afford it," she laughs, adding that she hopes "to sell it as soon as it is complete." I can-t afford it, either, although I love the plan for the approximately 4,700-square-foot house and the fabulous location out in the country yet near all that downtown Charleston has to offer. But I know someone will jump at the chance to own this property and, unless I miss my guess, Yvonne will net exactly what she is hoping to get.